At the risk of stating the obvious, just selling wireless connectivity is unlikely to make the Internet of Things (IoT) a meaningful profit contributor for most communications service providers (CSPs). The connectivity share of IoT revenue is worth around 10 percent of the IoT addressable market, according to Ericsson estimates. Depending on which guesstimate one uses for the size of the IoT market, the connectivity portion could hence be worth between $30 billion and $300 billion by 2025. The blue-sky estimate would be quite meaningful in the context of a telecom market expected to be worth around $1.5 trillion in 2021, but the low-end estimate would barely move the dial. More importantly, basic connectivity is likely to be a low-margin business for CSPs, as it is essentially a commodity that will face increasing competition as low-power WANs take off. CSPs can participate in the IoT value chain at the connectivity layer and the service provider layer. Some CSPs have acquired or developed their own IoT applications (telematics, fleet management, etc.) in order to get industry vertical-specific expertise and take a greater share of the pie. When a telco moves up the food chain to become an IoT service provider, it needs to package connectivity plus third-party hardware and software, and sell the bundle as a managed service. This is when things get tricky from a monetization perspective. To manage IoT services, CSPs often leverage their existing business support system (BSS) and operations support system (OSS) assets: self-service dashboards, customer relationship management (CRM), billing, service activation, etc. In addition, they develop or buy connectivity management, device management and application enablement tools. Depending on its role in the IoT value chain, a CSP will implement all or only some of these elements. Legacy telco billing systems are expensive to adapt and trying to do so could result in a "cost to bill" in excess of the ARPU potential from IoT (as little as $10 per year for basic LTE-M connectivity). As such, many mobile operators have used the in-built monetization capabilities of the IoT platform providers (Jasper, etc.). While these have been satisfactory in the initial phase of IoT deployments some operators are now considering alternatives either to increase the flexibility of their IoT monetization or to reduce costs. Additionally, some telcos have built IoT businesses such as fleet management via merger and acquisition. Each acquisition came with its own billing system, and the CSPs are now looking to consolidate their IoT monetization around one platform. IoT Monetization: Beyond Billing explains what functions and processes an IoT monetization solution encompasses (hint: it's more than just billing); the key challenges to successfully monetizing the diverse range of pricing and business models covered by IoT; and the alternatives that CSPs are considering for their IoT monetization solutions (IoT connectivity platforms, subscription billing tools, legacy BSS), along with their various pros and cons. The report profiles two IoT service providers and examines the factors driving their technology choices for IoT monetization. It also outlines the key requirements to consider when choosing an IoT monetization solution and discusses how CSPs can turn their monetization capability into a platform "play" for other industry participants to make use of. The report profiles 11 vendors of IoT platforms, multi-industry subscription billing and telco-oriented billing solutions. The vendors were selected based on our non-exhaustive research into the topic of IoT billing and the degree to which companies made themselves available to talk with us. The selection is not intended to be a comprehensive list of suppliers of subscription billing, IoT connectivity or general telco BSS. The IoT monetization picture is complex, and does not fit neatly into the established frameworks for understanding B/OSS, such as TM Forum's eTOM taxonomy. As such, we have adopted our own taxonomy for IoT monetization, shown in the excerpt below. 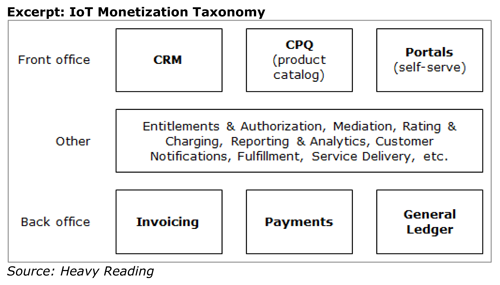 All of the elements in our IoT monetization taxonomy are interlinked and must share information. Undoubtedly there are elements missing from our simplified classification, as well as aspects that do not fit with every vendor's approach. However, the key point is that by "IoT monetization," we mean more than just customer invoicing. IoT Monetization: Beyond Billing is published in PDF format.